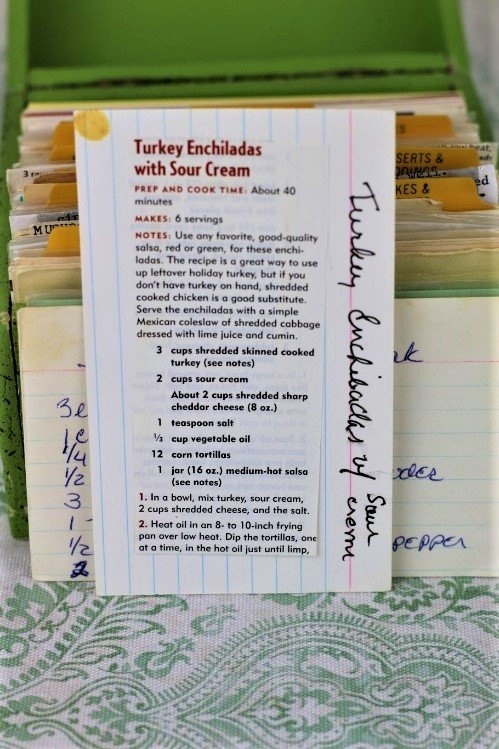 Front of the recipe card for Turkey Enchiladas With Sour Cream. 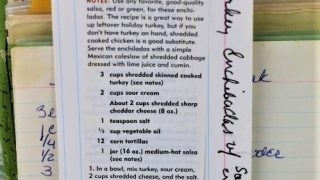 There are lots of fun recipes to read in the box this recipe for Turkey Enchiladas With Sour Cream was with. Use the links below to view other recipes similar to this Turkey Enchiladas With Sour Cream recipe. If you make this Turkey Enchiladas With Sour Cream recipe, please share your photos and comments below! In a bowl, mix turkey, sour cream, 2 cups shredded cheese, and the salt. Heat oil in an 8- to 10-inch frying pan over low heat. Prep and cook time: About 40 minutes, Makes: 6 servings. Use any favorite, good-quality salsa, red or green, for these enchiladas. The recipe is a greay way to use up leftover holiday turkey on hand, shredded cooked chicken is a good substitute. Serve the enchiladas with a simple Mexican coleslaw of shredded cabbage dressed with lime juice and cumin.